The per worker median budgeted expenditure was $268, with roughly half of the respondents indicating projected outlays of $106 to $790 per employee. Nearly 6 out of 10 respondents reported responsibility for EPA compliance, but fewer reported responsibility for OSHA compliance; nearly 25% reported that they had no responsibility for OSHA compliance. Michael Fox from Jottings by an Employer’s Lawyer points us to a useful resource from the EEOC: How to Comply with the Americans with Disabilities Act: A Guide for Restaurants and Other Food Service Employers. And if ADA compliance has slipped off your radar screen lately, you may want to read Michael’s report about a recent $1.3 million jury judgment in a Louisiana disability case which involved the ADA. Voters cast a resounding no vote on Measure 38, a proposal to dismantle SAIF Corp. The high-profile campaign to abolish SAIF Corp., the state-owned worker’s compensation insurer, was failing by a wide margin in early election returns. Liberty Northwest, the private insurer that bankrolled the campaign, conceded that Measure 38 was doomed in a written statement issued shortly after 8 p.m. Tuesday. 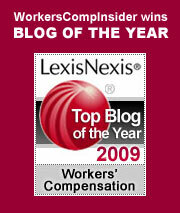 The Workers Compensation Research Institute recently issued a profile of the Arizona workers compensation system. … notable features of Arizona’s workers’ compensation system included a lifetime entitlement to medical and indemnity benefits – payments to replace lost wages – and the active role of the state agency in educating and assisting system participants and reducing litigation. However, injured workers were subject to some of the lowest weekly benefit levels in the country. Safer workplaces appear to be slowing the premium increases for workers’ compensation insurance in Missouri, Department of Insurance Director Scott Lakin said Wednesday. Based on rate changes for this year filed by 206 insurers, the overall market rate has increased 2 percent this year, compared with 15 percent last year, Lakin said in a written release.